Introduced by J Cheal & Sons, Crawley. It was recorded as a variety by the RHS in 1902. It is currently cultivated as part of Brighton Permaculture Trust’s National Collection in Stanmer Park, Brighton. You can see a Crawley Reinette apple tree (planted 2010) in Home Farm Orchard, Stanmer Park ( map). 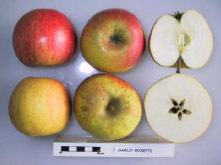 The Crawley Reinette apple is quite sharp and becomes sweeter in October, with firm, cream flesh. The skin is yellow with an orange-red flush with some russetting and prominent lenticels. Size medium. Shape convex to straight. Truncate to conic. Reinette refers to the areas of russet on the apple, though it was originally intended to denote a fruit of quality (Saunders 2010). Ripe in mid-October and can be stored until February. The Crawley Reinette tree is moderately vigorous.